Looking for the best black bean soup? Search no further. 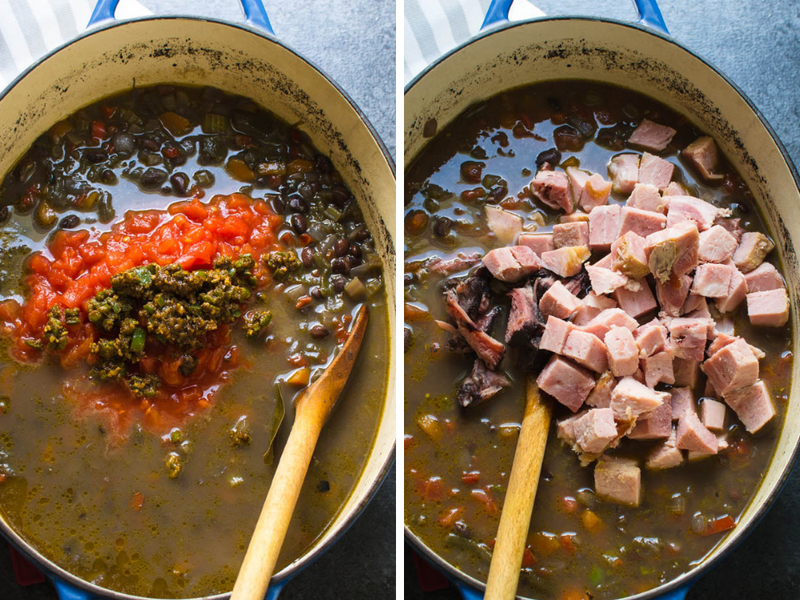 My Smoky Black Bean Ham Soup is thick and meaty and loaded with extras like fire roasted hatch chiles, diced tomatoes and jalapenos. Top this ham hock and beans recipe with all your favorites, like queso fresco, cilantro and a squeeze of lime. 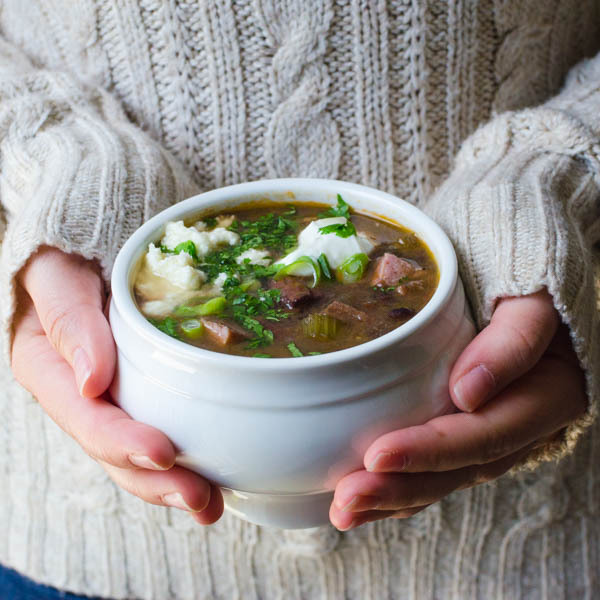 This ham bone bean soup recipe is perfect for cool days. I don’t know about you, but during the holidays my refrigerator was so jam-packed that it was like a game of Tetris — stacking Tupperware containers, trying to make room for new dishes while carefully extracting others. Sound familiar? The leftover with the greatest yield was a ham. I had been been staring at the remains of this smoked pork for the better part of 5 days, cutting off slices and chunks here and there to serve with leftover sweet potatoes for a quick dinner, with quiche for an easy breakfast, and in these angel flake ham biscuits, which I made far too many of. I was finally getting to my favorite part of the ham — the bone – THE essential ingredient for a ham bone and bean soup, don’t you think? To me, a ham bone is the jumping off point for any number of soups — vegetable, white bean, split pea you name it. Heck, just by covering the bone with water and letting it simmer for a few hours, you can achieve a broth that can be used in any number of dishes. If you don’t have a ham bone, many grocers will sell a ham hock — it has less meat than a leftover ham bone, but will add big flavor to your broth. Supplement the ham hock and beans recipe with a ham steak, cut into bite-sized cubes. Place the black beans in a large pot and sift through the legumes with your fingers. Remove any damaged beans or other foreign detritus, like pebbles or stones. Fill the pot with cold water so that it’s about 2″ above the beans. Cover the pot and let it sit 8 hours or overnight (or use the quick soak method). The next day, drain the beans in a colander and set aside. In a large dutch oven, sauté the vegetables until tender, then add the ham bone, beans, chiles and water. Add the ham bone or ham hock. While the beans are cooking saute the garlic and jalapeno. Stir in the cumin and onion powder and cook until fragrant and toasty. Set aside. When beans are tender remove the ham bone and let it rest until it’s cool enough to handle. Then trim any remaining meat from the bone. Add the diced ham and trimmed ham to the beans along with the jalapeño mixture and tomatoes. Simmer for 20 minutes until the flavors marry and adjust seasonings to your tastes. Though this ham bone and bean soup is awesome on its own, it’s even better with a few fresh toppings sprinkled on just before eating. I’d say everything except the squeeze of lime are optional — but trust me, you want that squeeze of lime. That hint of citrus turns this from a standard ham bone and bean soup to the best black bean soup ever. This makes a BIG pot of the best black bean soup! Chunky, rich, thick and satisfying, it’s a ham hock and beans recipe with staying power. It makes a hearty filling dinner with a green salad. So much so, that my diners went back for seconds (and thirds). The scant leftovers were promptly claimed for lunch the following day. A simple, hearty soup, thick with vegetables and smoky ham. In a pot, add the dried beans. Sift through them with your fingers to remove any debris or stones. Add three cups water to cover beans. Soak the beans overnight. The next day, drain the beans and set aside. In a heavy dutch oven, add two tablespoons of olive oil and sauté the celery, bell pepper, onion and carrot for five minutes or until the vegetables are tender. To the vegetables, add the beans, bay leaves, hatch chiles and ham bone and 7 cups water. Bring to a boil, reduce heat to medium low, cover and simmer for 1 1/2 hours, stirring occasionally until beans are tender. Meanwhile, in a small sauté pan, heat 1 tablespoon olive oil. Add jalapeño and garlic and sauté for one -two minutes, until tender and fragrant. Add cumin and onion powder to garlic mixture about a minute, until cumin smells toasty. Remove from heat. Using tongs, remove ham bone from the soup. Remove any loose meat from the bone to go back into the soup. Discard the bone. Add diced ham, garlic mixture, tomatoes, salt and pepper. Stir to combine, simmer, covered for 20 minutes on medium-low heat. Taste for seasonings and adjust as needed. Serve with your choice of toppings. I serve this with little condiment bowls filled with garnish and let everyone finish their soup with their favorite toppings. Pin “Smoky Black Bean Ham Soup” For Later! With the weather, black bean soup sounds awesome! Love the veggies, Black Bean and Ham option to this yummy Soup. This soup is so perfect for the season and best for a healthy and delicious dinner. This looks incredible and so warming! We are set for a cold snap and I’m a 35 weeks pregnant and craving healthy comfort food right now, so it’s the perfect soup recipe to keep me going! congratulations on your pregnancy — and yes, the baby wants SOUP! This soup looks fabulous! AAAND I see several other soups of yours I want to also try. Love the garnish options as well. Thanks for the video to demonstrate just how easy it is to make. Perfect for the colder weather. I used my leftover black bean soup today and my husband and I really, really liked the addition of the ham. My soup was a bit on the soupy side so in addition to the ham I topped it with diced oven roasted potatoes, onion, red bell pepper, and baked tortilla strips. After filling our soup bowls there was a little leftover, however it did not go to waste. We both went back and finished that off. Thanks again for the inspiration. 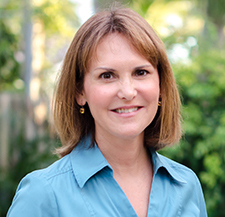 Hi Joan! I’m so glad you enjoyed the soup and love your ingenuity! The potato and tortilla sound like a hearty addition! I have some leftover black bean soup, ham, and various small amounts of veggies. Your soup has inspired me to put them all together. Thanks ever so much for your posting. Looks like you have an additional white colored topping other than the sour cream. Looks like mashed potatoes or maybe cauliflower. What is it? That’s the Queso Fresco! — It’s a mild, fresh, crumbled cheese usually found near the standard cheddars and monterey jack. It’s usually packed in a round plastic wrap and you just break off what you need and crumble it over your dish! You could use other cheeses here as well. Made this! So good on a chilly day!